Even some professional makeup artists find it difficult to properly apply liquid eyeliner, so rest assured that you are not alone if you currently have issues doing that. For some, it is as a result of an overactive eyelid, while for others it is because of shaky hands. 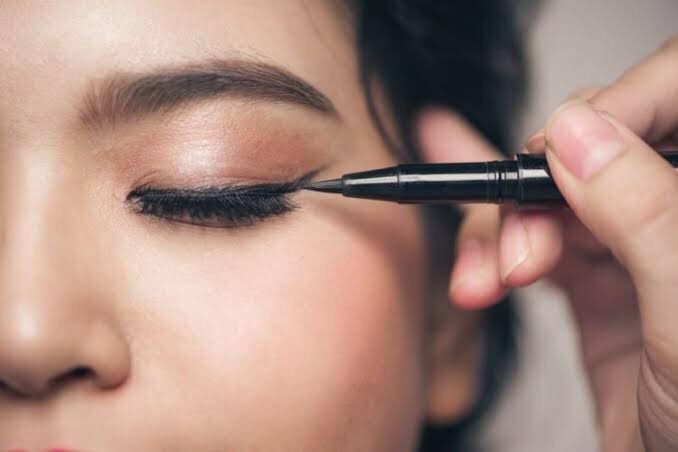 Some makeup experts have shared some common mistakes that people often make when trying to apply eyeliners and how best to fix these errors. According to one of the beauticians, Felicia Walker-Benson, an important factor in getting it right is choosing a product you find comfortable. There are various designs of liquid liners and it is best to go with the one which feels easier for you to control. Your choice could be a gel liner pencil while for another person it could be the felt tip pen. Walker-Benson said she uses the Intense Ink Eyeliner by E.L.F Cosmetics as it is super rich and is superb for skin tones that are darker. She added that the felt tip also helps her with control and precision. Steffanie Strazzere of Kat Von D artistry said that one common mistake she has seen a lot of people making is thinking that the liquid liner is supposed to be just one line. She added that rather than make a line while trying to get a winged liner, she makes several little lines then she later connects them. Once she gets a relatively straight line, she tries to perfect that with a slightly heavier hand. Walker-Benson advises trying out various application techniques to get the one which perfectly works for you. You could try a free-handed stroke or even making dashes and subsequently connecting them. To her, makeup has a fun element since it allows you to clean off and experiment with several ideas. Most people are always attempting to line the lashes and also create their cat eye with just one stroke. Strazzere recommends that it’s more productive to do these two things in two different steps. Drawing the outline of the cat eye, according to her, should come before you line your lid. 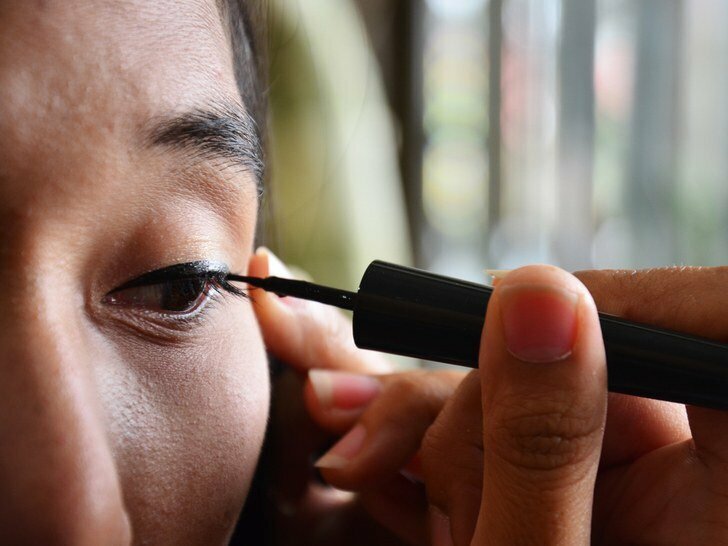 You can start that by drawing one line from the outermost edge of the eyelid, then you proceed to the tip that runs along the lash line and then draws a second line to connect with the first so it forms a point. What shape this produces is an open triangle and you can proceed to repeat the process on the second eye. She further explained that the next thing is to draw one line across the lid and it should sit right on your lash line. Then to finish the process, you proceed to fill in the outline. The level of pressure you use when applying your liner can have a major effect on the result you get. For a person who wants to get a perfect end, Strazzere advises that you hold the brush farther. That is because the lesser the product that comes out, the more tapered the line you get will be. If you hold the liner tip closely, there is more pressure when you are drawing any line and that leads to more product coming out which does not produce the best result. Thus, Strazzere advises that for you to get an intentional and more precise line, you hold it close to the ends. Strazzere explained that tugging on the lid makes your makeup appear worse. She explained that when you shut your eyes, it causes a contraction of the eyelids which makes the skin shrink together and when you open your eyes, the result isn’t always so nice. If you rather choose to look down as you apply the liner, it causes an expansion of the skin and that allows the line to come out better. Looking down gives your eyes a natural smoothness and you do not have to tug or pull. Walker-Benson also said that she likes to throw her head back in such a way that she gets to see the relevant area of her eye better. Thus it is best if you can find alternative ways for your liner application that doesn’t require you to tug your lid.